Will Sparrow's Road by Karen Cushman. Review: "I care for no one but myself and nothing but my belly!" says Will Sparrow. However, that soon begins to change as the events in Will Sparrow's Road come together to help form a beautiful companionship between the troubled characters of this wonderful story about a lost boy, by Karen Cushman. Will Sparrow, the protagonist, is a young rejected boy, but a sly liar and thief as well! All he ever wanted was to run away and be free, free from the innkeeper his father has sold him to for nothing but ale! He soon learns he is going to be sold into the city by that horrible innkeeper to be a chimney sweep. "Nay! Ne'er!" protests Will. Finally, he escapes and finds himself free and alone on the road toÉwell, somewhere better than where he is now. Unfortunately, that hope of a comfortable life is far from where he currently stands. Along the way, Will meets Nell Liftpurse, a liar and thief who stole his only food! Farther along, he meets the Tooth Puller, another liar and thief who broke his promise of providing a meal for Will! Can Will Sparrow trust any man to take him in? Is he going to survive in such a cruel world alone on the road to what seems like nowhere? In the beginning, the story progressed a little slowly as Will trudged along the boring road, but soon it sped up and kept me hooked as he encountered buffoonish children, and people who he found just as thieving as he was! Karen Cushman was able to create such original and well-developed characters. For example, Will is a young liar and thief, but that doesn't mean he doesn't have a heart as big as anyone else's. Also, his new friend, Grace Wyse, has the bravery of a knight in shining armor! However, she is no ordinary girl, for she lives with the face of a cat, and was sold to her owner, Master Tidball, by her mother when she was young. Despite the circumstances, she walks through the town with her face held high. Cushman's story also has an incredible setting: Elizabethan England at the end of the 1500s. This setting gives the story a very unique language consisting of words such as "nay, aye, sooth, and certes." Also, glimpses of Latin throughout the story such as, "cave et cura", meaning Òand take care". Although the meaning of these words is sometimes difficult to understand, the dialect keeps you engaged in the story because of how different the words are from today! In conclusion, I would definitely rate this book with 4 out of 5 stars because although it was slow in the beginning, the story comes through with incredibly interesting and dynamic characters. In addition, the plot and setting tie together so well to form a completely amazing story! Check out Will Sparrow's Road at your earliest convenience! 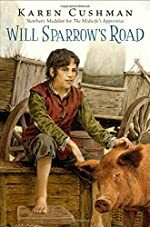 We would like to thank Houghton Mifflin Harcourt for providing a copy of Will Sparrow's Road for this review. Have you read Will Sparrow's Road? How would you rate it?